Head coach Eric Lindros leads a talented Team Orr roster into the 2018 Sherwin-Williams CHL/NHL Top Prospects Game. Team Orr features top-ranked skater Andrei Svechnikov of the Barrie Colts as well as top-ranked goaltender Alexis Gravel of the Halifax Mooseheads. Here’s a closer look at Team Orr’s lineup. NHL Central Scouting says: A big goalie with very good quickness, flexibility and athleticism – excellent compete and work habits – has strong and powerful leg drive which makes him effective when reacting to shots or recovering for a rebound – very efficient in his crease management – good angle play on initial shots and while moving laterally across the crease following a pass – very solid and strong protecting the wrap around attempts – strong legs for very quick lateral movements and post to post play – very good overall net coverage – quick snapping his pads to the ice quickly in the butterfly; seals the ice and five hole effectively– has a very good and confident glove hand – very good overall rebound control – has good pro skills. NHL Central Scouting says: Pro size; has a huge net presence – mostly plays a positional blocking style – tends to play deeper in the paint then other goalies but he’s effective utilizing his size and good angle play – very good net coverage when down in the butterfly ( good leg extension while keeping his body upright to protect the upper portion of the net ) – excellent with rebound control ( directs the low shots and absorbs the shots off the ice ) – battles to track pucks through traffic – very strong and efficient in his post to post play and wrap around coverage; solid and strong on the post – good glove hand quickness. NHL Central Scouting says: Very good mobility and agility; has a quick step to his game- can either elude defenders or start an offensive rush – displays soft / quick hands in all areas of the ice -competes hard at every level; finishes hits – uses his vision and hockey sense to start and finish plays; generates offense – quarterbacks the power play and effective on the penalty kill – good positioning and containment down low – good composure under pressure – not overly physical but effective angling opposition to force mistakes / turnovers with good stick and body position- solid at both ends of the rink. 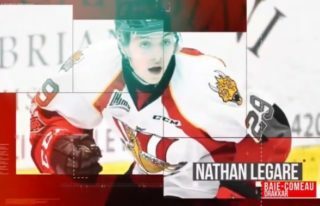 NHL Central Scouting says: Huge on-ice presence at 6’6 – plays a composed game under pressure and has a good puck movement game – sees the ice well and can sort out the right option and execute with efficiency – plays a strong positional game utilizing a good long stick and body position to eliminate opposition from getting to the net – possesses a physical element to his game and is concentrated on making opposing forwards earn their opportunities – has proved to be a valuable shut down puck moving defender for his team. NHL Central Scouting says: Plays a consistent two way game – keeps his head up & feet moving allowing him to be on top of the play and maintain good position – very efficient game advancing the puck – moves the puck quickly and with authority – quick in transition with good precision handling & moving the puck on the PP – firm, accurate shot from the point – good mobility & positioning to defend & break up plays – good gap & active stick defending – stands out effectively with his assertiveness in all areas of the ice. NHL Central Scouting says: Very effective puck moving, two way defenceman – good puck distribution game and possesses a very good shot from the point on powerplay – good skater with quickness and mobility – sees many options on zone exits or can skate the puck out of trouble – supports the rush and makes himself a good option – point producer with size that defends well and utilizes strong positioning and a good stick in defensive zone – top five in QMJHL defenceman scoring all season. NHL Central Scouting says: Very good puck moving defenceman that sees the ice exceptionally well – srong skater with mobility that can move pucks up ice quickly – supports the rush and distributes the puck well on the powerplay – effective utilizes good feet and physical game to defend – good stick to puck technique and positioning in defensive zone. 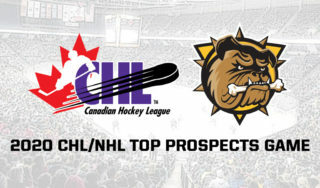 NHL Central Scouting says: Top 10 in points for defenceman in the WHL – very smart player with excellent puck skills – poised and patient with the puck – sorts out options very well – very efficient skater with excellent mobility – capable to log heavy minutes and plays in all situations – defends well using his stick and body position. NHL Central Scouting says: Possesses a very quick burst of speed giving him an advantage on plays – plays at a high energy level; excellent on the forecheck – reliable to be utilized in all situations – always a threat when given time and space – drives the net well – creates most of his chances coming in off both sides – effective two hundred foot game; aware of his defensive responsibilities – noticeable on most nights because he gets chances- a better finish would enhance his value – capable of some high-lite plays with his speed. NHL Central Scouting says: Very good offensive hockey sense; has a good creative aspect to his game – very good vision and anticipation – more of a play maker coming in off the wall – displays quick hands with a soft touch around the net – sees play developing before line mates can react at times; makes players around him effective – very slippery and elusive with the puck; can mesmerize defenders at times – quick feet in tight quarters – always a threat on the power play. NHL Central Scouting says: Strong skater with good speed and quickness to be on top of plays and getting to where he needs to be – good hockey sense to make effective choices / decisions moving the puck – has the puck skills to execute passing plays and get the shot – very good game getting to the net to generate or be open on play for chances – consistent work ethic to play a two way game and he’s effective on the forecheck to get to loose pucks first – a young Knights player who has shown glimpses of having the ingredients of an NHL prospect. NHL Central Scouting says: Strong hockey IQ with a knack to always be in the right place on the ice at the right time – competes hard and goes to the dirty areas to make plays – very good vision and ability to find open man – strong two way game and used in all situations by his coach – executes the details of the game well and is strong below the dots protecting the puck and winning battles. NHL Central Scouting says: Skilled forward who can score; quick to recognize scoring opportunities – strong, accurate shot and has good instincts and quick reactions to get himself into shooting position – good size and skater to be effective in one on one play – good offensive hockey sense and makes good decisions with puck. NHL Central Scouting says: Strong and effortless skater; has deceptive speed and agility – utilizes speed on the rush to take the defenseman wide while protecting and shielding the puck – speed and puck handling ability allows him to gain the offensive zone very effectively – arguably one of the best passers available for this upcoming draft – very good instincts and very smart and patient game with the puck – very reliable and smart away from the puck; plays a strong two way game – good balance and quick hands in the face-off circle – he plays in all situations and has a big role on his team. NHL Central Scouting says: Highly skilled centre with natural offensive instincts – manipulates poor defensive gaps with his precision like passing – excellent play maker that every winger wants to play with – his game away from the puck can’t be taught and allows him to execute plays with more time and space – offensive catalyst for his team. NHL Central Scouting says: An offensively skilled player – very good hands and creative game especially when given time and space – good vision handling and moving the puck – good at finding the open man and delivering the puck for a quality chance – quick shot and release as well as one time ability – he skates well and when playing with energy can be very effective and a dangerous offensive threat. NHL Central Scouting says: Big, strong power forward who demonstrates good hockey intelligence and a soft touch around the net; has “puck on a string” abilities; – possesses a multi-dimensional skill set where he can make plays on the rush while using his size, strength and pull away speed to beat defenders wide or out of corners – could have the best puck protection game in this Draft class – a rare and valuable blend of size, skill and speed. NHL Central Scouting says: Big body forward that can play effectively in the middle or on the wing – smart player away from the puck – good on the penalty kill – good details to his game – good shot with a quick release – strong game driving to the net and can make plays in tight areas. NHL Central Scouting says: Plays the game with speed & precision – excellent offensive hockey sense seeing the ice & getting open on plays – high end skills with puck control, hands & shooting – smart driving to net and accurate finishing touch; has a quick release shot – heads up anticipating & reading plays – extra gear with skating to get through traffic / checking with the puck – deft hands / moves to go along with his confidence make him a viable scoring threat every time he’s on the ice – high end skills and assets; one of the top players in North America. NHL Central Scouting says: Smaller, skilled forward that has good vision and ability to find the open man -strong on the puck and goes to the dirty areas to score goals – good hands and elusive skating; can score in tight – deceptive skater that is hard to knock off the puck – good smarts to play an effective two way game and makes good decisions at both ends.